Soaperstar: A Simply Stunning Trio of Creams! Well today was a very very busy day. In between getting ready for holidays, I was making three different creams to take away with me. In the picture below, you can see my Mocha Chocca Maca Butter at the back - this is made from a fantastically scented blend of Coffee Butter, Macadamia Nut Oil and Belgian Chocolate fragrance oil. It has added moisturising factors and, as with all of my creams, contains a small percentage of preservative to ensure it stays fresh and wonderful to use for at least 12 months. 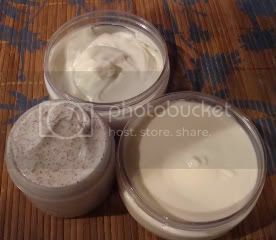 The second one, on the right hand side, is my Vanilla Tahitian Body Butter which has the most wonderful Monoi De Tahiti Oil, Mango and Shea Butter - it is thick and unctious and just smells so wonderful. To enhance the natural scent of the Monoi De Tahiti Oil, I've added some Tonka Bean fragrance oil (which gives a scent like a mix between vanilla and caramel - can you smell it now?!). Again it has an additional moisturising factor added which is an Ecocert registered ‘green’ biolipid derived from 100% natural and renewable materials. Added at 3%, it gives a perceivable difference in skin smoothness and softness. Finally I made a very simple cream with added ground peach stone kernels - this is called Simple Scrubber and feels wonderful. Made from Olive Squalane, an oil derived from Olive Oil, it prevents moisture loss and restores the skin's suppleness and flexibility and is ideal for anti-aging products. It also includes Orchid Complex which is derived from the orchid flower infused in coconut oil. The Orchid flower has regenerative, protective and moisturising properties, it helps fight free radicals and may help reduce the appearance of fine lines. Ground peach stone kernels are added to provide an exfoliant for the face. I cannot wait to try all of these - my house smells simply divine at the moment!! !